*Price above based on 1-year term before application of coupon code/introductory discount. While you may pay less for the first year of hosting, the price displayed on this page is the 1-year term renewal rate. Star ratings based on a 0.5 minimum to 5 star maximum scale. You might think that an A+ BBB-rated hosting company that offers low-cost plans including unlimited disk space, unlimited bandwidth, unlimited domains, 24×7 in-house phone support, and a 30-day money-back guarantee would do well in NCM Online’s rankings. We certainly did. Unfortunately, we were wrong. MyHosting.com’s sign-up process is overly complicated. The Parallels control panel is somewhat confusing. 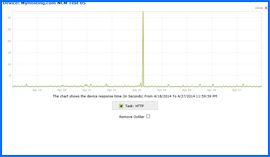 Our testing determined that uptime was less than 100%, and server speed was amongst the slowest tested to date. In all, we found our MyHosting.com experience to be anything but satisfying. MyHosting.com has earned the NCM Online designation of NOT RECOMMENDED. MyHosting.com offers three reasonably-priced shared hosting plans: Personal Website, Business, and eCommerce. All three include unlimited disk space, bandwidth, and domain hosting (the ability to host more than one site on the same account). Also included are a free domain name (for the first year), 24×7 in-house phone, chat, and e-mail support, as well as a 30-day money-back guarantee. We opted for the lowest cost plan as we always do for testing purposes. Available initially at $4.95 per month based on a 1-year term, the Personal Website plan renews at $6.45 per month after the first year. So far, so good. After clicking the “Sign Up Now” button, we arrived at the first page of the 4-part order form. We immediately spotted something we see far too often when purchasing web hosting. Two of the four additional cost options had already been checked off for us. As we did not want or need these options, we unchecked them and clicked the “Continue” button. 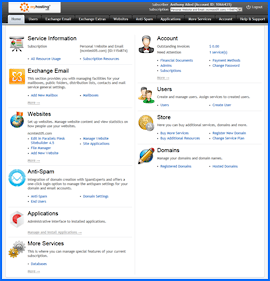 MyHosting.com Parallels control panel. Click to enlarge. The most popular option — use a domain name you have already purchased and simply update your current registrar’s nameservers — did not merit its own tab. The task could be completed however, by entering the domain name in the Transfer Domain box (without actually transferring it). This somewhat dubious practice is meant to confuse novices into either transferring their domain to MyHosting.com, or purchasing a new domain name (free for the first year) with the Personal Website plan. Unfortunately, we have seen a number of hosts utilizing this questionable practice and we will continue to call them out for it whenever we see it. On a more positive note, the “welcome” e-mail included almost all of the information required to set up our test site. Whatever information was omitted (such as the nameservers) could be accessed via links in the e-mail. Further, we found the Parallels file manager to be easy to use and efficient. We were able to set up our test site in short order. MyHosting.com Uptime Test Results Chart. Click to enlarge. Uptime testing began April 18th and was completed on April 27th (see uptime chart right). The first few days showed 100% reliability. However, on April 23rd at 5:51 AM (EST), the server began having problems. In all we received 8 TCP errors (10060) and 2 HTTP errors (12002), when attempts to access our test site from Minnesota, New York, Florida, California, Montreal, London, Frankfurt, Amsterdam, and Hong Kong all failed. The problem continued for approximately 17 minutes. Uptime testing concluded on April 27th without additional downtime incidents. Speed testing results for our simple 1-page test site were equally unimpressive (see test results chart below right). Site speed was fastest when accessed from Minnesota with a relatively slow page load time of 1.829 seconds. For purposes of comparison, A2 Hosting was able to load our site in only 0.7245 seconds from Minnesota. Site speed was slowest when accessed from Hong Kong, recording an average of 2.1178 seconds to load our test site. 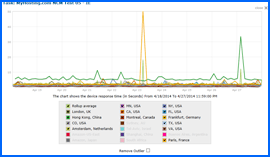 In comparison, A2 Hosting averaged just 1.2598 seconds to load our test site from Hong Kong. MyHosting.com Speed Test Results Chart. Click to enlarge. All web hosting services reviewed by NCM Online are purchased and subjected to our 10-day test for uptime and speed. MyHosting.com recorded a poor average speed of 1.887 seconds to load our test site from 13 locations worldwide, and 1.231 seconds from 7 U.S. locations. Tested for uptime every 15 minutes over 10 days, MyHosting.com produced a less-than-perfect 99.8813% reliability score. Our MyHosting.com experience was not very good. There are certainly faster, more reliable, and easier-to-use webhosts in the same price range. MyHosting.com has earned 3.5 stars and is not recommended by NCM Online. Cheap website hosting company price comparisons based on 1-year term list price before coupon/promo codes or limited time/introductory offer discounts. These are the renewal rates for the second year of hosting. To ensure that you receive the most affordable MyHosting.com pricing possible, please visit our Web Hosting Coupon Codes page for current discounts and special offers before making any purchases. MyHosting.com is a global provider of reliable and affordable website hosting services. The company offers its 50,000 clients, from 170 countries around the world, choice and value for their money. Toronto, Canada, hosts the headquarters of MyHosting.com, a web hosting service that was established in January 1997, and has created a name for itself for using state of the art technologies and services from reputable companies like VSNL International, Network Solutions, Cisco Systems, Microsoft Corporation, Verizon Business/MCI Canada, Tucows Inc. and Intel Corporation. In today’s market, there is a lot of competition, so a strong web presence and up to date information systems are important for any company to succeed. MyHosting.com appreciates this fact, and the firm has done a lot to provide superior quality services to all customers by utilizing the latest and most superior Internet technologies. With nearly two decades of experience in the website and email hosting industries, the firm is the right fit for any business that wants to succeed. The company has a lot of experience in Virtual Server Hosting, SharePoint Hosting and Hosted Exchange among others, so they can cater to the hosting needs of every business. MyHosting.com keeps all its equipment in state of the art Earthlink and Equinix Data Centers. Customers can rest assured that their data is safe because the servers are kept in a fully redundant environment with the most advanced network and physical security measures. The storage units used by the company are from Network Appliance while the servers are from Dell Corporation, and networking equipment from Cisco. The company’s hosting services come with a 100% Uptime guarantee. Furthermore, the firm offers a 1-to-1 credit for any interruption on VPS Hosting, Web Hosting, SharePoint Hosting and Email Hosting services as outlined in their SLA. The North American office hosts the firms Account Management and Customer Support teams. The staff in these departments are available 365 days a year, 24 hours every day through live chat, email and phone. With a clientele from different time zones, the company ensures that customers can get in touch with them when they need to,regardless of time or date. Earthlink Enterprise and Equinix Data Centers, located in Rochester, New York and Toronto, Canada respectively, house the company’s web servers. Users of websites that are hosted by the company enjoy a superior browsing experience because the firm’s servers are linked directly to global fiber optic networks which offer better security and full-redundancy. MyHosting.com has deployed the very best in web server technology. The firm uses Dual Quad Core Dell servers with 16 GB of Random Access Memory and NetApp Storage arrays. The hosting services provided by MyHosting.com are defined by reliability, speed and superior performance. The company’s Data Centers have video surveillance within the building and outside, 24 hour guard service, and card access among other security measures that help to ensure security of client data. Since only authorized personnel can access the Data Centers, MyHosting.com can assure their clients that their data is safe. Apart from physical security, the company also uses the very best in network security technologies including 24 hour monitoring by Information Systems Security experts, Intrusion detection scanners which provide real time security alerting, enterprise-class firewalls with multi-layered architecture and unparalleled virus protection. MyHosting.com is able to guarantee 100% Uptime in case of network failure because the company’s servers are linked to the rest of the world via bundles of fiber optic cables, so there is always an alternative data path if one fiber optic cable fails. This type of network engineering is fully redundant and offers greater bandwidth as well as the best throughput speeds. The result is a reliable and high-speed network connection for all customers. MyHosting.com Data Centers are connected to the Grid, but they also have alternative power sources in case of failure. This includes Uninterruptible Power Systems (UPS) and diesel-powered generators for continuous, uninterrupted power supply. The temperatures of servers in the Data Centers are regulated using efficient HVAC systems. Multiple air conditioners ensure that there is proper humidification and cooling to guarantee optimal performance at peak load without failure of the servers. In a bid to protect sensitive equipment at the Data Centers from fire damage, the company uses FM-200 as a fire suppressing agent. This environmentally friendly compound replaced Halon 1301. Customers who experience any type of problem on their website can get in touch with the staff at the customer care center for help at any time. Customer assistance is available through chat, phone and email. This video tutorial demonstrates the installation of WordPress on a MyHosting.com shared hosting account using the Parallels control panel and applications installer.